It was December 19th. Daniel Sprong, one of the Penguins’ brightest future prospects, was sent back down to his QMJHL team, the Charlettetown Islanders. In his 18 games with the Penguins, Daniel Sprong scored 2 goals, had no assists, and was a -1. One of the biggest criticisms of Sprong is that he has not quite developed a solid defensive game yet, which led to him playing somewhere between 4 and 7 minutes per game on the fourth line. So yeah, Daniel Sprong’s defensive game is not spectacular, but I do not think it ever will be. He can and will get better and has to be more responsible in the defensive zone, there’s no doubt about it, but the Penguins need to accept that Sprong isn’t going to be winning any Selke Trophies any time soon. Since Daniel Sprong’s return to the QMJHL, he has posted 15 goals and 29 assists, which is good for 44 points in only 31 games. This would give him his best points per game total, 1.42 PPG, since he started playing in the QMJHL. During his previous 2 years he posted 1.01 points per game and 1.29 points per game respectively. This may be in the QMJHL, but the stats don’t lie. He is posting impressive numbers. Daniel Sprong may not be the most sensational defensive forward out there, but boy is he gifted offensively. He has a fantastic release, super quick hands, is a fast skater, and can pass the puck too. But the difference is that he was a constant healthy scratch, played on the 4th line, and barely got to play at all. Phil Kessel was brought to the Penguins to score goals and provide offense. Many believed, including myself, that Kessel could easily post 40+ goals being that he was a lock to play with either Crosby or Malkin. Although Penguins’ fans did set high expectations, I do think Kessel has absolutely under-performed as a whole. In 70 games, Kessel has 21 goals and 27 assists, giving him 47 points. This is not an awful output, but from a guy like Kessel playing with guys like Malkin and Crosby, it should be higher. Also, he has been insanely inconsistent. Although he just had a goal and an assist last night against the Hurricanes, he scored his first goal in 8 games (and his previous goal was an EN goal), and often follows performances up like these with a dud. That being said, I want him to prove me wrong, and gosh darn it I hope he does against Philly tomorrow. Similar to Sprong, Phil Kessel is not any threat defensively. Currently, Phil Kessel is a +2 for the Penguins. His only other season he was a “plus player” was 2008-2009 with Boston when he posted a +23. That being said, Phil Kessel was not brought here to play defense: he was brought here to score goals. Kessel has not left Crosby or Malkin’s side for the most part. And, well, he’s Phil Kessel. It doesn’t make much sense to move him down to the 3rd or 4th line. He has been kept on the first PP unit until only recently, despite not shooting as often as he should or scoring for that matter. Meanwhile, Daniel Sprong never had any legitimate chances to play with Crosby or Malkin because the coaches felt he was a liability. Then, when it came time for power plays, which is where Sprong would be extremely effective on the right side, the coaching staff still did not use Sprong, and continues to use guys like Kessel and, at the time, Perron. It should also be noted that Sprong not only did not get these opportunities, but he played almost all of his game under Mike Johnston’s system. He played only 2 games under Sullivan, which were within that 0-4 start when Sullivan was hired. Now, the Penguins have an identity, and for me, Daniel Sprong fits right in. So, although I am not advocating for Sprong to play over Kessel, my argument is this: if Kessel gets a chance on the top PP, and a chance to play with Malkin and Crosby, why not let Sprong have his chance next year? Kessel hasn’t been “demoted” due to his lack of defense. Rather, the coaching staff feels he can score, and so they give him his chances. Okay, fair. So give Sprong a chance. Kessel, until recently, continued to be put on the top PP unit despite his lack of quality shots and goals. But the coaching staff felt he would turn around. Again, fair. So why not let Sprong, who is often selfish with the puck (in the best sense of the word), a chance with the top PP, or at least one of the power play units? Let Sprong do what he does best and provide offense. Sprong is only 19, and will only be getting better, but the Penguins need to give him a chance to do so in the top 6 if they want him to develop correctly. Alex Light: What are your thoughts on the new lines that just came out? Sprong on the 3rd line is just a little bit off in my opinion. Also, what do you think about the fact that Johnston is “experimenting” with some of the line changes? First of all, I love love LOVE the fact that Johnston finally put Kessel with Malkin, and put Hornqvist back with Crosby. Last year, Crosby and Hornqvist really developed some awesome chemistry. I also think that Hornqvist’s playing style of getting to the front of the net encourages Crosby to shoot more and gives him more space to work. Kessel with Malkin is going to work. I promise you this. Malkin plays such a dominant game, and loves possessing the puck in the offensive zone. This draws defensemen in towards Malkin, and gives players like Kessel more space to find the soft spots in the defense to look for opportunities. I said it once, and I’ll say it again: James Neal was a 40 goal scorer with the Penguins, and he played with Malkin, not Crosby. As of now, I am not a huge fan of Plotnikov on the 2nd line, but both Perron and Kunitz failed to succeed in a top 2 line role, so I guess Plotnikov is getting a second crack at it. Finally, let’s talk about Sprong. I would love to see him on the first or second line, BUT he is a natural right winger, and with the likes of Hornqvist and Kessel, it is highly unlikely that Sprong plays over either of these 2 guys. The only way he plays in the top 6 if they convert him to be a left wing, which I do not think they will do. He should see way more than 8 minutes of ice time per game, which is about what he is getting. He is one of the Penguins’ most skilled offensive forwards, and the Penguins are lacking in the goal scoring department. 2 + 2 = 4 right? Then let Sprong do what he does best: score goals. As for the last part of your question, I understand why Johnston wants to experiment with the line combinations, because clearly something needs to jump start this offense. That being said, experimenting with line combinations is something that should be done in the preseason. Johnston pretty much kept Kunitz, Crosby, and Kessel together and kept Plotnikov, Malkin, and Hornqvist together. That’s your time to “experiment”, not now. But line changes needed to be made, and I’m glad he at least did that. Josh Godwin: Will Bruce Boudreau coach for the Pens at some point this year? Brad Franjione: First, let me fill everyone in on the situation. Bruce Boudreau is currently the coach for the Anaheim Ducks. During the preseason, the Ducks were seen as one of the Stanley Cup favorites. All of that being said, the Ducks are 1-5-1 to start the season, with only 6 goals scored in those 7 games. Boudreau is probably on the hot seat, and if the Ducks continue on this downward slide, Boudreau could very easily be unemployed soon. 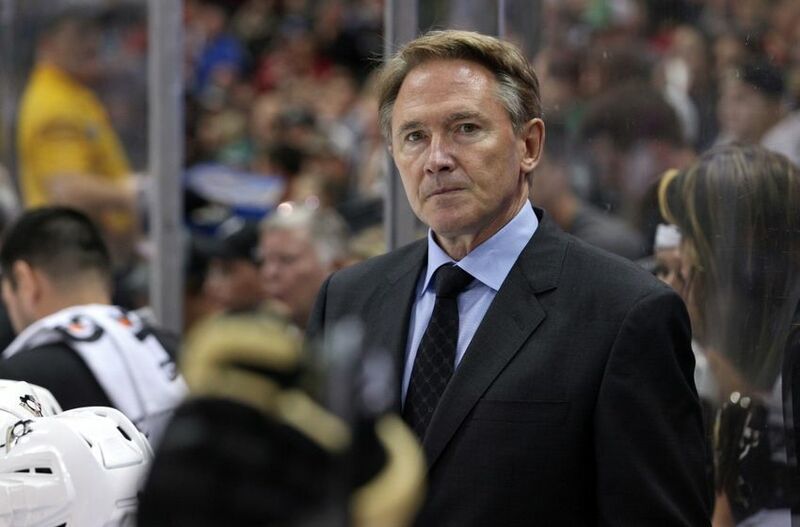 As we all know, the Penguins are struggling to find offense, and Mike Johnston is definitely on the hot seat here in Pittsburgh. If both Boudreau and Johnston get fired (theoretically), I would think that there is a chance the Penguins take a look at Boudreau. However, this would only be a realistic situation if Boudreau was fired before Johnston, and the Penguins were able to get in contact with Boudreau and initiated talks with him about coaching in Pittsburgh. I would give a higher probability to see either Tocchet or Jacques Martin behind the bench if Johnston is let go. But there is absolutely a chance that the Penguins would consider Boudreau if that was an option for them at the time. Nick Bermel: Why do the Penguins always lose to the Flyers? Are the Flyers just the superior team? Brad Franjione: Well, let’s start off by saying that the Flyers have not won a Stanley Cup since 1975. The Penguins have 3 Stanley Cups since then. Oh, and were the Flyers in the playoffs last year? That being said, you do bring up a good point. I want to say it’s been 8 games straight that the Flyers have beat the Penguins in head to head match-ups. I think that the rivalry between the Penguins and Flyers adds some crazy intensity to every game, and I think the Flyers know how to take advantage of that. The Flyers play in a way that really gets into the heads of the Penguins’ players, and the Penguins play into that style that the Flyers play. Props to the Flyers for that. In addition, the Flyers have some solid offensive threats up front in Giroux, Voracek, Simmonds, and others. The Flyers have been the superior team in head-to-head matchups against the Penguins in recent years, but they are by no means the superior team in general. Raafay Rishi: Which NHL defenseman do you think the Penguins will trade for and who will the Penguins give up in the trade? Brad Franjione: To be quite honest, Raafay, right now the defense is not the problem. The offense is. But as I said in one of my previous articles, the defense is going to decline slightly as the season goes on. The Penguins right now are stacked offensively and need help on defense…at least on paper. Who do I think they should go after? Dustin Byfuglien. The Penguins do not have many physical players, and Byfuglien answers that concern. He hits people HARD. He also has a bomb of a shot, and is a great power play guy, which the Penguins really need right now. So, if the Penguins were to pursue Byfuglien, who do they give up? Right now, the centerpiece of that trade for me is David Perron. He has offensive skill and can be a decent player, but he just does not seem to fit anywhere into the Penguins lineup right now. The Penguins would have to throw in something else besides Perron, but I think he would be the centerpiece. Some other pieces that the Penguins would consider using along with Perron could be players such as Kunitz, Scuderi, or even young defenseman Derrick Pouliot. I’m not sure if the Penguins will pursue Byfuglien, but I do not have a problem with taking advantage of the offensive surplus and helping firm up the defensive corps, especially considering that the Penguins only have two top pair defensemen and a bunch of other bottom pair guys. Now that I think about it, I’d buy a Byfuglien shirt. Casey Chafin: Let’s jump to the major conclusion that Johnston is out. What do you look for in a replacement, style wise? And what immediate changes should the new guy implement? Brad Franjione: If you do not know, Johnston’s style has a very “defense first” mentality. The offense is created through defense and the defense move up into the play to help create offense. The coach of the Penguins needs to be a guy who coaches in an offensive-minded style. The Penguins are built upon their star players’ success. They have star power up front, and they are clearly one of the best offensive teams in the NHL, at least on paper. The Penguins should be winning 6-3 type of hockey games, not 2-1 hockey games. The new coach needs to be one that puts the emphasis on offense, not defense (although defense is obviously still important). In regards to the second part of your question, I think the biggest immediate change (besides the overall strategy) is the power play. The power play is just not working, but it needs to be. The players are too good for it not to work. In the last 3 years of Bylsma’s stint with the Penguins, the Penguins had power plays clicking at 19.7%, 24.7%, and 23.4% which ranked them 5th, 2nd, and 1st in the NHL respectively. So clearly Crosby, Malkin, Letang and co. can be successful. Obviously the power play can work, but it obviously hasn’t under Johnston and Tocchet. The Penguins finished with a power play percentage of 19.3% last year, which is not too bad at all. That being said, the power play was clicking at about 40% for the first 20 or so games. This means in the last 60 or so games, the power play was not working so well. This year, the Penguins power play is only clicking at a 7.1%, which is 29th in the NHL. This needs to be fixed, and it needs to be a priority for the head coach that takes over Johnston, because I do not think he will be here much longer. Doug Godwin: What would you attribute Sid’s lack of production to over the last 2 years? Declining skills? Coaching? NHL changing? Brad Franjione: Well, let me start with this: last year, scoring in the entire NHL was down. The Art Ross winner Jamie Benn had only 86 points. Crosby finished with 83 points, and finished first in the NHL in points per game. The NHL is general is changing. Goalies are getting bigger, the pads are getting bigger, and goals are harder to come by. It showed last year. Although Crosby was first in the NHL in points per game, he really hasn’t looked like “vintage Crosby” over last season and this season. Especially this season. If you recall, Crosby had one great game against the Panthers this year where he registered a career high 9 shots on goal and had 3 points in that game. He had some hop to his step and played an absolutely terrific game. Past that, he has been invisible. I think part of his problem right now is coaching. Johnston has been questionable to say the least, and considering he had no NHL coaching experience before taking over the Penguins, I’m not sure how much respect and trust Crosby has in this guy. His main problem? He needs to shoot. Hopefully this problem is partially solved through reuniting him and Hornqvist, but regardless, Sid needs to shoot. He showed us all that when he shoots the puck, good things happen. When you’re as good of a player as Sidney Crosby, you’ll score goals and put up points when you shoot as much as he did against the Panthers. Case and point: Alex Ovechkin. The guy has a tremendous shot, and shoots the puck like crazy. He gets rewarded by collecting Rocket Richard trophies like it’s his job. Remember that Crosby was a Rocket Richard winner himself. He has the ability to do it, but now that he isn’t the only star player on the team, he feels the need to pass the puck. A LOT. Like, way too much. Yeah, Crosby is not as young as he once was, but he hasn’t lost much skill at all. I do not think this is an issue at all. He just needs to play with confidence and be a little more selfish with the puck. You want to see Crosby’s production trend in the upwards direction? Tell him to shoot. Grant Franjione: Two questions for you: how do you explain the Penguins complete inability to bounce back from even 1 goal deficits when trailing after 2 periods of play? Also, when I watch the Penguins, it just seems like chances to score in today’s NHL are just super tough to come by, but yet I see less offensively talented teams have occasional outbursts of 4, 5, or even 6 goals in a game. What are those teams doing that the Penguins aren’t? Are they just luckier? Brad Franjione: Well, let’s take this one question at a time. So, from what I could remember, the Penguins were actually a pretty good comeback team when playing under Dan Bylsma. They have been the exact opposite under Johnston. Although some of the players change every year, the Penguins have had the same core players throughout this span. So, is their inability to come back simply based on the head coach? Well, the problem is that I FEEL like the Penguins were a good comeback team under Bylsma. But I wanted to convince you AND myself that the Penguins were a much better comeback team under Bylsma than they are under Johnston. So I decided to do some research and calculations. From the beginning of the 2009-2010 season to the end of the 2013-2014 season, which is the time frame where Bylsma was the head coach (excluding his stint with Pens in 2009 when they won the Cup) the Penguins won 21.19% of their games when trailing going into the 3rd, which is good enough for 2nd in the NHL during that span. Yeah, the 2nd best winning percentage when trailing going into the third period! The Penguins are currently 0-21-5 in that category under Johnston. Yikes. Last year, the Penguins scored only 12 goals in 23 opportunities when they entered the 3rd period trailing. In this situation, the Penguins were only scoring .53 goals per period, while they averaged .89 goals per period throughout the season. This year, the Penguins are 0-3 in this situation, and have yet to score a goal when going into the 3rd down by at least a goal. The Penguins, under their 5 full seasons under Bylsma, won 45.35% of their games when they allowed the first goal of the game. Their NHL rank in this category in this 5 year span? 1st. You heard me, 1st. The best team in the NHL at winning games when allowing the first goal. Under Johnston, the Penguins have only won 26.32% of these games. Convinced yet? If not, I have one more stat for you. Under Johnston, it seems as though the Penguins have at least been pretty good at holding a lead when they get it. They are 4-0 this season when scoring the first goal, and have not been trailing in any of these 4 games. So, under Johnston, the Penguins have won 69.82% of their games when scoring the first goal. Under Bylsma? The Penguins won 74.47% of their games when scoring the first goal. Why did they get rid of Bylsma again? To answer the second part of your question, let me start with this. The Penguins shooting percentage this year is 5%, which is 29th in the NHL. Last year, the Penguins had a shooting percentage of 8.39%, which is less than the shooting percentage of any Penguins team under Dan Bylsma. So, why are the Penguins not scoring a ton of goals with their offense? Well, they aren’t scoring on many of their shots. So, why aren’t they scoring on many of their shots? To Johnston’s credit, the Penguins finished 4th in the NHL in shots per game last year, and currently sit in 4th place in the NHL this year in shots on goal per game. But is shot volume really the answer? Here is my thought: when a coach preaches about shot volume, as a player, you are going to focus on shooting the puck (unless your name is Sidney Crosby, then you’re never going to shoot the puck). However, I think this gives the players a mentality of “let’s make sure we get shots on goal.” In other words, they’re shooting to shoot. They’re not shooting to score. I think this is the underlying difference. Shot volume is important, but the some of those shots need to come on quality chances, and the players have to shoot to score, not just to shoot. That concludes this week’s Q and A! I’ll be doing the same thing next Tuesday! As always, thank you again to everyone who keeps up with me, and a special thanks to those who participated in my first Q and A session. Remember to follow me on Twitter @FranjiPensPress and like me on Facebook at Franjione Pens Press. My next article will be up late on Wednesday night after the Penguins face off against the Capitals on rivalry night. Well, the Penguins’ offense did not show much…yet again…tonight, but the Penguins were able to hold on to the Predator’s surge in the 3rd period, and won the game in overtime 2-1. The Penguins were out shot pretty badly in this game. 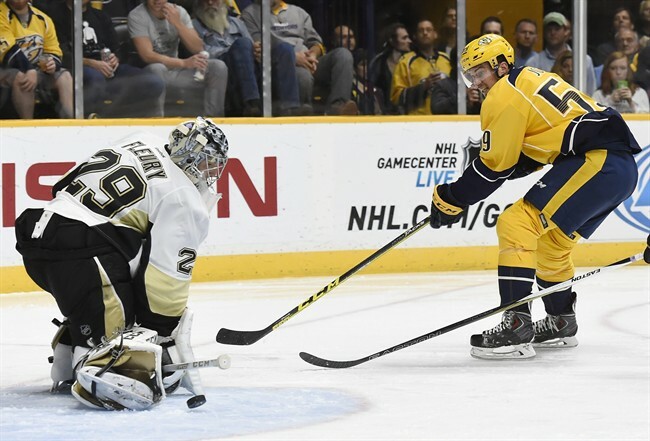 The Predators peppered Marc-Andre Fleury with 39 shots, while the Penguins threw 25 at Pekka Rinne. The shots were reasonably even after 2, but the Predators entered the 3rd period down 1-0, and out shot the Penguins 17 to 5 in the final frame. Also note that the Penguins improved to 4-0 when scoring the first goal. In addition, the Penguins have NEVER been trailing in any of those 4 games. The exact opposite can be said about the other 4 games. With just over 10 minutes to go in the game, the Predators had the puck in the Penguins zone. 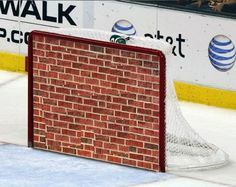 There was a post hit and a number of crazy saves by Fleury. This continued on for 2 minutes with no whistles. Literally. The puck finally came out to center, but the Penguins took a penalty, so the Predators were playing 6 on 5. Mike Ribeiro fed a pass to the slot to none other than James Neal. His first shot was stopped, but he went thin mints on the rebound and tied the game at 1. Pens 1 Predators 1. I was very surprised that Johnston did not challenge this goal. It appeared as though Jackman may have prevented Fleury from making a save on the second attempt, which would have nixed the goal. Even with his timeout available, he did not challenge the goal and the call stood. So…Where the Heck is the Power Play? 8 games into the season, the Penguins power play is clicking at 7.1% which is currently 27th in the NHL. Last year, under Johnston, the Penguins finished 10th in the NHL with a power play that was clicking at 19.3%. Although that does not sound terrible at all, it is notable that the power play was clicking at some outrageous 40% through the first 20ish games. Excluding that red hot start to the power play last year, it really has not done anything significant under Johnston. At all. Here is what baffles me: if you told me to pick 10 players in the entire NHL to create 2 “all-star” power play units, I would easily pick Crosby and Malkin, and even debate picking Kessel and/or Letang. So…why does this power play stink? Is it Tocchet? Johnston? The players? Some combination of the 3? I’m really not sure. But I will say this: under the final 3 years of Dan Bylsma, the Penguins ranked 5th, 2nd, and 1st in the NHL on the power play with percentages of 19.7%, 24.7%, and 23.4% respectively. Also, this was arguably with far less offensive fire power than the Penguins have this year. All I know is that 7.1% is not good enough. This one is going to be quick: Daniel Sprong, one of your most gifted offensive forwards, had 2 shifts in the 3rd period, skated on the 3rd line, and logged less than 10 minutes of ice time tonight. I could not help myself with researching this topic. The Penguins currently rank 29th in the NHL in shooting percentage, with 4.985% of their shots finding the back of the net. The only team lower than the Penguins is Anaheim, who is only scoring on 3.106% of their shots. After looking at those shooting percentages, keep in mind that the NHL average is 8.895%, and the first place team in this category, the Washington Capitals (who will be facing off against the Penguins on Wednesday) are scoring on 13.997% of their shots. So, how important is shooting percentage? Here is where the stats come into play. 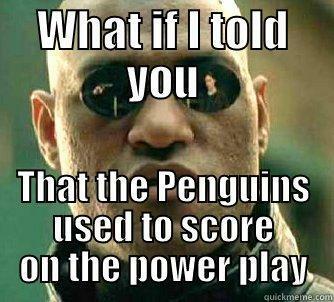 How the heck are the Penguins 4-4?! They are at a .5 wins per game and a 1 point per game clip, which is significantly higher than the average of the bottom 15 teams…And the Penguins are 2nd to last in shooting percentage!! It’s almost a miracle that their record is not worse than 4-4. On the other side of things, the top 15 NHL teams in shooting percentage are averaging .6 wins per game and 1.3 points per game. These teams, on average, are on pace for 49 wins and 107 point seasons. See the difference? If not, put on some glasses and try again. All of this being said, I guess a win is a win. BUT, clearly, something is wrong. Something is seriously wrong. Remember to follow me on twitter (@FranjiPensPress) and like me on Facebook (Franjione Pens Press). Also, remember that I am doing a Q and A on Tuesday, so start submitting your questions! On Twitter, use #FranjiPensPress and your question, and on Facebook comment on one of my posts that discusses Q and A. I will be answering every question I get! The Penguins lost a tough one 4-1 to the Dallas Stars on home ice Thursday night. The Penguins dominated the first 6 minutes of the game, and arguably played their best hockey they have played all season. There is just one problem: they didn’t score any goals during this span. Following the 6 minute dominance by the Pens, Stars defenseman Johnny Oduya took a wrist shot from the point that literally floated in on goal. The puck found it’s way past Fleury, and the Stars took a 1-0 lead and never looked back. Adding to the stats, the Penguins are now 0-4 when allowing the first goal, and have been either trailing or tied throughout the entirety of these 4 games. In addition, that 1.67 goals per game drops to 1.57 goals per game after they only scored 1 goal tonight. AND the defense gave up 4 goals against a very good Dallas Stars offense, who play a lot like how the Penguins SHOULD play. This put the Penguins goals against average at 2.14. Didn’t I just publish an article about this? Oh yeah… What a coincidence!! So, who is at fault here? Here is the guy that is not at fault: Jim Rutherford. He went out this offseason and gave the coaching staff the pieces to work with, which is his job. Yeah, their defense isn’t necessarily anything fantastic, but it shouldn’t have to be with the offensive players that Rutherford brought in during the offseason. So ruling out Jim Rutherford, there are only 2 “people” to blame here. One is the players, and one is the head coach. Let’s talk about the players first. The Penguins have been getting their fair share of chances. They still rank 2nd in the NHL in shots per game. So why is the goal total so low with all the talent they have? Is anyone else tired of that argument? I certainly am. Every once in a while, a team runs into a goalie that is playing well, but it should not be an every game thing. I don’t really care about Neimi’s history against the Penguins, today was a new game and the Penguins had a chance to beat him and didn’t. It’s as simple as that. It’s on the players to do what they’re supposed to do and score. It’s on the players to be able to keep their heads in the game when they give up a goal early in the first period to go down 1-0. Those kind of things are on the players. The rest is on the coach. I have no idea what upper management is thinking right now, but I would have Mike Johnston on a very very VERY short leash right now. Even though the Penguins are 3-4, which is actually a pretty good record considering their team statistics right now, they have not been scoring goals. To me, this is mainly attributed to the coach. He has stuck with the line of Kunitz, Crosby, and Kessel since day one. I have news for you Johnston: it’s not working. He has stuck with Hornqvist, Malkin, and Perron for most of the time, after making the obvious move of shifting Plotnikov to the 3rd line. This line hasn’t worked either. To top it off, one of your best offensive players, Daniel Sprong, has been logging a team-low in ice time while getting an occasional shift on the fourth line. One thing that may help is making some line changes. Clearly, the line combinations Johnston has right now are not working. Kunitz has been below average for at least a year now, Hornqvist has not looked as effective as he can be with Malkin, and Kessel and Crosby just have not found that chemistry yet. In addition, the top pairing of Cole and Letang has looked a bit sloppy, and understandably so. Ian Cole is not a top 2 defenseman. This is not a knock on Cole, he is just not quite that good. I like him on the team a lot, but he is playing way too large of a role to be effective. Let’s talk about what I changed here (at least the big changes). Put Sprong on the first line. Does he deserve anything less at this point? The Penguins need goals, and that’s exactly what Sprong gives you. He has speed, finese, and an NHL shot that he is not afraid to use at any time. Move Kessel with Malkin. Malkin has been the most dominant Penguins player by a long shot thus far in the season. I think Kessel’s production increases with Malkin rather than playing with Sid who is just gonna play the “you shoot it, no you shoot it” card with Kessel. One more time: remember James Neal? That guy who scored 40 goals for the Penguins a few years ago? Yeah, he played with Malkin…just saying. Let Dupuis play on the second line. Dupuis plays with energy and hustle and it’s a treat to watch him play. He makes the second line complete and provides the “defensive presence” if Malkin and Kessel get trapped deep in the zone. Plus who else slots here? Kunitz/Perron? Ummmm…no. Kunitz and Perron get dropped to third line. Both of these guys have been so subpar this season. Kunitz is looking like the Kunitz of last season, which is not good. 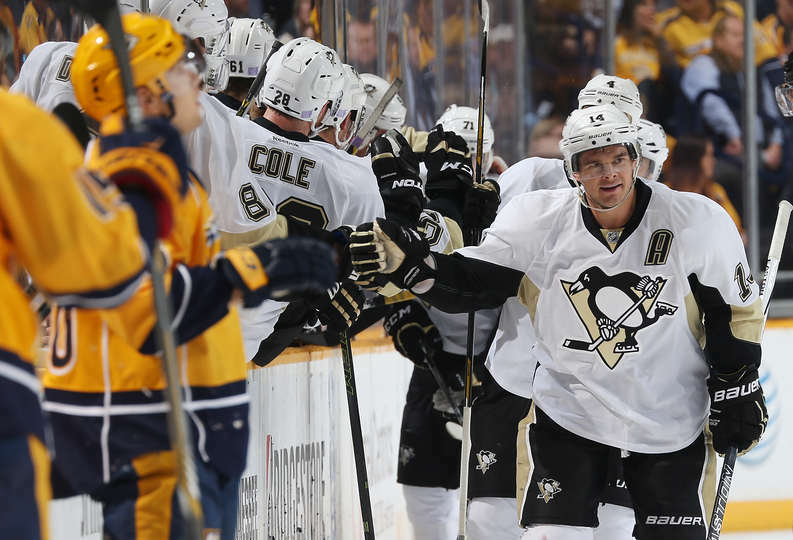 Kunitz has 1 point in his last 26 games dating back to last season. 1 singular point. Perron is invisible out there for the most part, and still has not looked like the David Perron they acquired that lit up the stat sheet in his first 10 or so games with the Pens. I do not mind them as third line players on this team, but as 1st and 2nd line guys respectively? I don’t think so. Put Letang and Maatta together. I was not for this early in the season, but the Penguins cannot get anything working on their back end, and I think this pair would be a great first pair. Plus, I like Cole and Dumoulin partnered up. Overall, I am placing the blame on Johnston more than the players. The players need to produce, but if Johnston is continuing to play a dwindling Chris Kunitz on the first line and sit one of his best forwards, then it makes it very hard for the forwards to do anything effective. They’re just banging their heads off of a cement wall at this point. That cement wall being the one that is put in front of the goal they’re trying to shoot at. Also, just remember, this isn’t just a little bit of a “rough patch” at the beginning of the season. This is a carry-over from last year. The Penguins in their last 27 games, including last year and the playoffs, are 8-19 with a 1.63 goals for per game. They have scored more than 3 goals only once during this stretch, and have been held to 0 or 1 goals in 14 of the 27 games. This is concerning. Look out Johnston, because if management knows what is best for this team, you better do something about this team… and FAST. On the bright side of things, congrats to Nick Bonino for his first goal in a Penguins uniform. His goal was entirely an individual effort, and a great one at that. Glad to see him on the score sheet. Anyways, thank you for everyone who read my stuff! I’ll be posting an article Saturday night about the Penguins vs. Predators game. Also, remember to like me on Facebook (Franjione Pens Press) and/or follow me on twitter (@FranjiPensPress) if you like what you’re reading. Ladies and Gentlemen: ELVIS. Has just. Left. The building. And FINALLY, the Penguins found their first win of the season. They topped a pretty good Ottawa Senators team 2-0, but it felt like it could have been 6-0 Penguins. The Pens came out and played desperately and it showed on the ice. They were finishing their checks and pouncing on every loose puck. They looked the best they have looked this season by far. Unfortunately, the Penguins announced this morning that forward Beau Bennett is out with an injury. Multiple sources reported Bennett not seeming like he was in pain after the game against Montreal, so it may be an unrelated hockey injury. Either way, Bennett was injured, so Mayhem himself Booby Farnham got a chance to play. In addition to Bennett getting injured, the Penguins recalled forward Bryan Rust and sent down Tim Erixon to the Penguins’ AHL affiliate team, the Wilkes-Barre Scranton Penguins. The most surprising news of the day for me were the players and line combinations that Johnston went with today. First of all, he made the decision to scratch Rob Scuderi and play Adam Clendening, who looked fantastic during camp. Scuderi has looked like nothing more than a traffic cone in the first 3 games. Sorry Scuds, you were important to the team in 2009, and I thank you for your contributions, but you’re just not an NHL caliber player right now. The Penguins kept Letang with Cole, paired Maatta with Clendening, which left Dumoulin and Lovejoy as the bottom pair. I think these are the Penguins best 6 defensemen right now. That being said, I’m sure Scuderi will get his share of games, but after tonight, it should be less. Also, one of the Penguins top prospects projected to make the team Derrick Pouliot is still in the minors, and I would imagine he gets a chance at some point to step in and make an impression on the coaches. Besides the scratch of Scuderi, Johnston also made the decision to scratch newcomer Sergei Plotnikov, which I found very interesting. I would imagine Johnston was more of just giving him a day off since he is currently dealing with adjusting to the life of the NHL and life in the US. He will be back as soon as next game, but I was surprised by the scratch. The Penguins top 2 lines looked the same as it did the last game, Daniel Sprong and Kevin Porter got a chance to hop up onto the 3rd line with Bonino, and Cullen centered Farham and newly called-up forward Bryan Rust. Just 23 seconds into the period, Evgeni Malkin put the Penguins on the board, and gave them their first lead of the season. The play actually began in Ottawa’s offensive zone. Some Penguins and Senators players were battling for the puck. Just as none other than Patric Hornqvist came out of the scrum with it, Evgeni Malkin bolted up the ice. Honqvist fed the puck to Malkin who went down the ice on a 2 on 1, and made no mistake as he ripped a shot past the blocker side of goalie Craig Anderson. Pens 1 Sens 0. Later in the period, Kevin Porter came up the ice with the puck. At about center ice, he gave the puck to Matt Cullen who was flying down the middle of the ice. Cullen carried the puck into the zone, and dropped a pass into the slot for who? Daniel Sprong. Sprong took advantage of the great pass by Cullen and went thin mints (where mamma keeps the cookies: top shelf!). Congratulations to Sprong on his first NHL goal. Pens 2 Sens 0. The Senators had some decent chances throughout the game but Fleury came through large. In addition, the Penguins really did play the better game here. They deserved to win, and came out with just that. Please Rutherford. Keep this guy in the NHL. I’ve said so much about this kid, and it’s because I really believe he can do great things. I understand the Penguins have Dupuis and Fehr out, but now they have Bennett out, and I imagine the Penguins would scratch Farnham and Rust before they would scratch Sprong (and this is nothing against either of these guys, who also had excellent games). 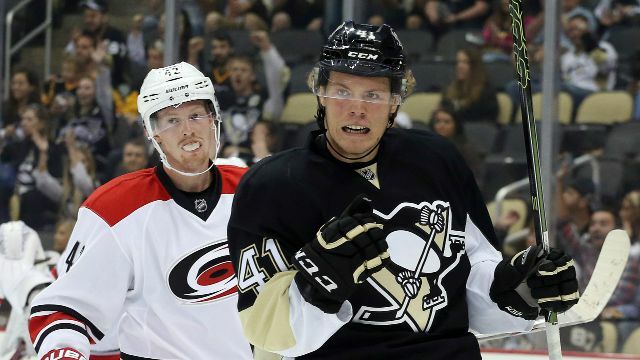 Daniel Sprong deserves to be here, and the Penguins need him here. Plus, what if other injuries plague the Penguins this year (which we all know is going to happen). Why send down Sprong when he is clearly capable to play at an NHL level? I have no clue what management thinks, but Sprong is making it a tough decision for management. I hope he stays, and it’s because he SHOULD stay. Although I do not know exactly what Rob Scuderi said, during the offseason, Scuderi said he would make the roster because he was the only defensive minded guy they have, and teams don’t play 6 offensive defensemen. Well guess what, Scuds. The Penguins went with 6 offensive defensemen tonight, and they not only won, but they didn’t even let up a goal! Crosby is STILL without a point. Malkin finally scored tonight (he is now at 1G 1A – 2P), which marks his first goal in about 20 games or so. Crosby on the other hand needs some help. I don’t think he’s washed up or anything like that. He is still the best player in hockey. I honestly think they guy is trying too hard. Ease up on your stick a bit Sid, you’ll be just fine. I’m noticing that Crosby is forcing passes into traffic…A LOT. I think this comes mainly because of Kessel, but also because Crosby thinks of himself as a playmaker, so that’s what he needs to do. However, Crosby has a Rocket Richard (which is the trophy for most goals scored in a season). Crosby has proven he can score, he just has to execute. I still think they should swap Hornqvist and Kessel, but I’ll try to stop beating a dead horse. Thanks to all who keep up with me! As usual, I will be posting a blog late Saturday night talking about the Penguins and Maple Leafs. And keep those heads held high tomorrow, Pens fans: your team finally won!